In my last acne update post, I talked about taking antibiotics and using Tazorac to treat my acne. To be honest, I was hoping it would only get better from there. Not exactly the case. Since August, I’ve been experiencing minor flare ups a week or two before my period every month. The dermatologist warned me about this, so I knew to expect it. This past month (October/November) my acne was the worst it’s been since July/August. It was painful and stubborn (the bumps didn’t want to go way), although not as bad as it’s been in the past. Come mid-last week I knew I had to do something. However, I didn’t want to go back to my dermatologist. While the antibiotics she had me take helped clear my skin to a degree, I don’t want to rely on them. As it is, I’m still using the Tazorac gel she prescribed. No more medication! I then thought back to all times where I’ve gone from a major acne outbreak to clearer skin and what I did to get there. Or should I say the one time, which happened to be six months before our wedding. This was when I stopped (cold turkey) drinking regular milk and switched to almond milk, stopped (cold turkey) drinking diet soda, and stopped (also cold turkey) using artificial sweetners. During this time, my skin cleared up in a big way. And I had ZERO breakouts the weeks leading up to our wedding. I wasn’t on any medication and I didn’t make any other changes. In my opinion, the only big change I made was to go from drinking 3-4 glasses of skim milk a day to maybe two glasses of almond milk a day. And I’m 95% sure my cheese and yogurt consumption was a lot lower than it is now. So after thinking about this [unintentional] experiment quite a bit, I’ve decided to try it again for a month or so to see if it helps calm things down. But this time around I’m intentionally trying my best not to consume any dairy at all (I still don’t drink diet soda or use artificial sweetners). It’s been eight days since I started on my (almost) dairy-free journey, and so far things are going…well. Not eating yogurt is easy for me because it isn’t something I consumed on a daily basis. Cheese, on the other hand, is a completely different story. I love cheese almost as much as I love chocolate, so purposely staying away from it has been a little challenging. And speaking of chocolate, most of the chocolaty treats I enjoy contain dairy…so there’s that. My plan is to see how my skin reacts to this change after about 30 days and then slowly reintroduce different dairy products one at a time. If my skins goes from mostly clear to acneville, I think it’ll be safe to say that dairy contributes to my acne. If that is the case, I’ll continue to be (almost) dairy-free because let’s be real, I can’t completely give up cheese and ice cream the way I did skim milk! I definitely plan to blog about the outcome of this little experiment and also share any dairy-free recipes that come out of it. Ooh I can’t wait to see how this no-dairy experiment works out for you, P- I really hope nixing it from your diet helps! My sister is prone to acne and going the bet results when she limited the amount of dairy in her diet so hopefully that should give you a boost. For hormonal reasons, I watch my dairy intake too and honestly, it’s easier than I ever thought! The only thing I miss is cheese and I’m okay with having minimal amounts as that doesn’t seem to affect/bloat me. Interesting! Let us know what happens. And for the record, if you are missing your ice cream fix this month, Trader Joe’s has really good vegan ice cream… and dairy-free cheese shreds, for that matter! Thank you for being brave enough to share things we often want to keep hidden away. I can’t wait to hear about your non-dairy experiment. I started having lactose intolerance and have been trying to cut out dairy. I found cashew cheese is a great replacement for most spreads. All the best with the experiment! I had terrible acne in high school and most of university – until I stopped eating dairy! I had done the antibiotics and even went on birth control as it was supposed to help (in both cases, I only ended up with an imbalance of good/bad bacteria in my body and too many side effects!) 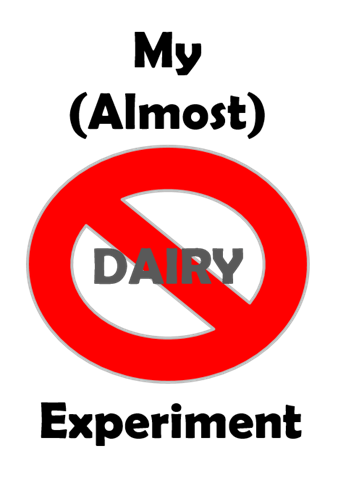 I actually went dairy-free to help with the imbalance and I was ecstatic that my skin cleared up – and stayed clear – as a result! It’s actually the cheese that was the culprit, not really things like butter or yogurt. I have found that goat cheese is ok, but if I eat a lot of cow cheese I will get a tell-tale zit to let me know I had too much! Good luck! As a fellow cheese lover I’m sorry to say that cheese and sugar are the two things that cause my acne to flare up. Whenever I have too much cheese I get those hard painful pimples near my chin. I hope your experiment helps! Raj @Pink Chai Living recently posted…What is Your Welcome of Home? Good luck, hopefully your experiment works. I’m a big cheese and yogurt lover too. I’ve tried coconut milk based yogurts and they were pretty good and some die cheese products were not bad either.